In horse racing, a bettor cashes a place ticket when the horse he or she bets on to place finishes either first or second in a race. 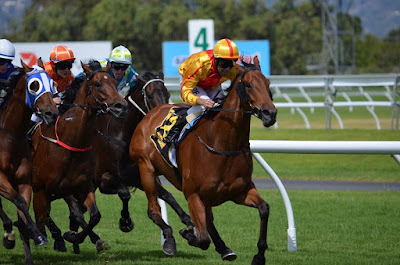 In general, a place bet usually pays less than a win bet because all the money in the place pool must be split two ways among both the winning horse, and the horse that finished second in a race. Place betting is extremely popular in the Kentucky Derby because the race attracts as many as 20 horses each year, and many bettors feel they can get value with a place bet. Plus, their horse does not have to win the race to cash the bet. These are all the horses that have paid the highest prices to place in Kentucky Derby history. All horses that paid $30.00 or more to place are listed, and the win amounts shown are for a $2 bet. The highest place price ever paid out in the Kentucky Derby is the $70.00 that Closing Argument paid in the 2005 Kentucky Derby. Closing Argument finished second in 2005 as the longest odds horse in the race, with odds of 71.60 to one. Giacomo, at odds of 50.30 to one, won the 2005 Kentucky Derby. So both the first and second place horses in the race were very high odds. That created a situation in which Closing Argument could pay a very high place price, even though all the money in the place pool had to be split among backers of both Closing Argument and Giacomo. We will see Giacomo on this list shortly. The second highest place price in Kentucky Derby history came in 2009 when the winner of the race, Mine That Bird, paid $54.00 to place. Mine That Bird went off at odds of 50.60 to one, and also paid the second highest win price in Kentucky Derby history. The second place finisher in 2009 was Pioneerof the Nile, who went off at odds of 6.30 to one. Pioneerof the Nile was third betting choice in the 2009 Kentucky Derby. Had a higher odds horse finished second in the race, Mine That Bird would have paid a lot more to place. The third highest place price in Kentucky Derby history came in 1951, when Royal Mustang finished second to winner Count Turf, and paid $53.00 to place. Royal Mustang went off at odds of 53.00 to one, and he was coupled in the race with stablemate, Golden Birch, who finished second to last. Count Turf was part of the field in the 1951 Kentucky Derby, meaning he was coupled with all the horses who had numbers above 12. The field entry went off at odds of 14.60 to one in 1951. Count Turf paid $14.00 to place. Invisible Ink paid $46.60, the fourth highest place price in Kentucky Derby history, when he ran second to Monarchos in the 2001 Run for the Roses. Monarchos went off at odds of 10.50 to one, and paid $11.80 to place. Giacomo paid $45.80 to place when he won the Kentucky Derby in 2005. Considering he went off at odds of 50.30 to one, and the longest odds horse in the race, Closing Argument, ran second, it's surprising Giacomo did not pay even more to place. Donerail, who paid the highest win price in Kentucky Derby history when he won the race in 1913, also paid the sixth highest place price of $41.20. Going off at odds of 91.45 to one, Donerail beat the heavy favorite in the race, Ten Point, who went off at odds of 1.20 to one, by half a length. There were only eight horses in the 1913 Kentucky Derby. Ten Point paid $3.50 to place. I'd say that less than 5% of the place money paid out in the 1913 Kentucky Derby was paid out to Donerail backers. The rest went to backers of Ten Point. Staretor, who finished second to Whirlaway in the 1941 Kentucky Derby, paid $35.20 to place. Whirlaway, the betting favorite in the race at odds of 2.90 to one, paid $5.00 to place. He would go on to win the Triple Crown in 1941. Zev, who wired the field and won the 1923 Kentucky Derby at odds of 19.20 to one, paid $30.60 to place.